Final Fantasy XIV: Stormblood is being released on the 20th of June. The second major expansion for the retooled Final Fantasy XIV it adds lots of brand new features, such as new classes and tweaks to Final Fantasy XIV gameplay. What do you get in Final Fantasy XIV: Stormblood? Here’s what you need to know! Final Fantasy XIV: Stormblood adds two new classes or ‘jobs’ to the game, each with their own new abilities and twists to the FFXIV gameplay you know and love. The first new class introduced in FFXIV: Stormblood, the Red Mage mixes up how you’ll play magic based DPS. A hybrid character which mixes both ranged and melee attacks, Red Mages are a class that’ll take some time to master but will give you much flexibility when you do. Using red magic that exists in between healing white magic and offensive black magic, they’ll combine their magic abilities with rapier attacks to deal huge amounts of damage. FFXIV: Stormblood’s gameplay will be something you’ll have to master before trying a red mage, as they’ll start from level 50 so being familiar with the game is advised! A strength-focused warrior that like the Red Mage starts at level 50 without a base class, the Samurai also wields a dual handed katana for massive close range DPS. FFXIV: Stormblood will add this class to the game in a way which means it shares gear with the Monk class, which means those familiar with Monks may have items around that can be shared across the classes. The Samurai’s class arts focus on three forces, Setsu (Snow), Gestu (Moon), and Ka (Flower). Final Fantasy XIV: Stormblood will add new raids and dungeons for adventurers to challenge themselves in. This 8 Person raid will be focused around Omega. In Final Fantasy XIV lore, Omega was hired initially by the Allagan Empire to capture Bahamut, a legendary dreadwyrm. Hundreds of years in the past it fell to stasis, and has slumbered ever since. Now with Final Fantasy XIV: Stormblood being released, Omega has woken and a new challenge awaits adventurers. This 24 person raid takes you back, back to Ivalice. A place not seen since Final Fantasy Tactics and Final Fantasy XII, Ivalice is a legendary land that is rich in Final Fantasy lore. 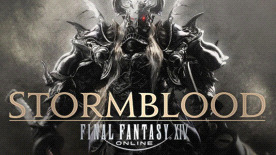 The mind behind these games has returned to craft a whole new storyline involving this raid and Ivalice, and we’re sure that many Final Fantasy XIV players will be amazed at what they experience in Stormblood. We’re promised new dungeons in Final Fantasy XIV: Stormblood, and while we don’t have much information at the moment about what’s new, we’re sure they’ll exemplify the Final Fantasy XIV stories and gameplay we all love. On an island located far away in the distant Eastern land of Hingashi, Shirogane lies awaiting FFXIV: Stormblood players to reach it and make it their home. It has an Eastern feel to it and the architecture reflects that, making it an ideal home for a Samurai or Red Mage. It’s time to take to the sea, in FFXIV: Stormblood, gameplay gets an enhancement by allowing you to swim and dive underwater. This is an exploration mode only, as you’ll not be able to engage in underwater combat, but expect to interact with NPCs and harvest good whilst under the sea. You’ll be able to expand beyond your job and class in FFXIV: Stormblood, by having access to a generalised pool of skills which’ll allow you to modify your playstyle and the gameplay of the game to better fit how you want to approach the game. The UI of the game will get some new interface elements, to make sure that FFXIV: Stormblood gameplay is easy to understand and comprehend, and that new job skills and class abilities are easier to parse and use. No longer will you have to hunt for extra bag space, FFXIV: Stormblood is adding lots of new space for your inventory. This’ll mean less time dealing with your inventory, and more time out in the world, adventuring. Final Fantasy XIV: Stormblood will be released on the 20th of June for PlayStation 4 and PC. The glorious Final Fantasy MMO is getting a new expansion, called Stormblood. This is the second major expansion for Final Fantasy XIV and the Stormblood release date is 20th June. MOOGLES! Love them or…well you should love them, there’s nothing as cute as a moogle. So we decided to let them fight it and here’s the results! The Best moogles in Final Fantasy according to Green Man Gaming . KUPO! There’s a lot out there on Final Fantasy, but who has the time to scroll through over 40 tidbits on the franchise, you’d probably rather be playing it. So we’ve compiled 5 awesome facts that you might not know, so you can return to roaming Eorzea undisturbed.